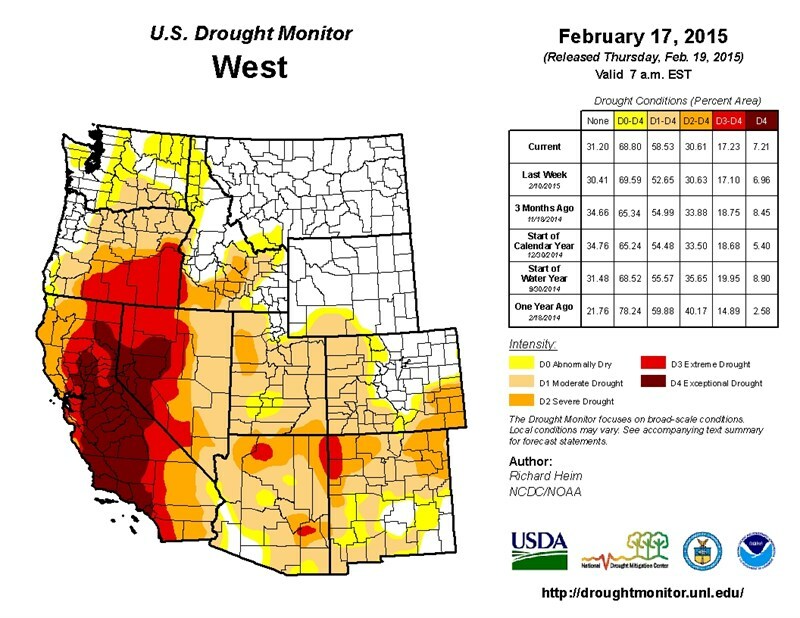 The U.S. Drought Monitor said Thursday that the highest level of drought, "exceptional drought," expanded in parts of California and Nevada, after another week without precipitation. 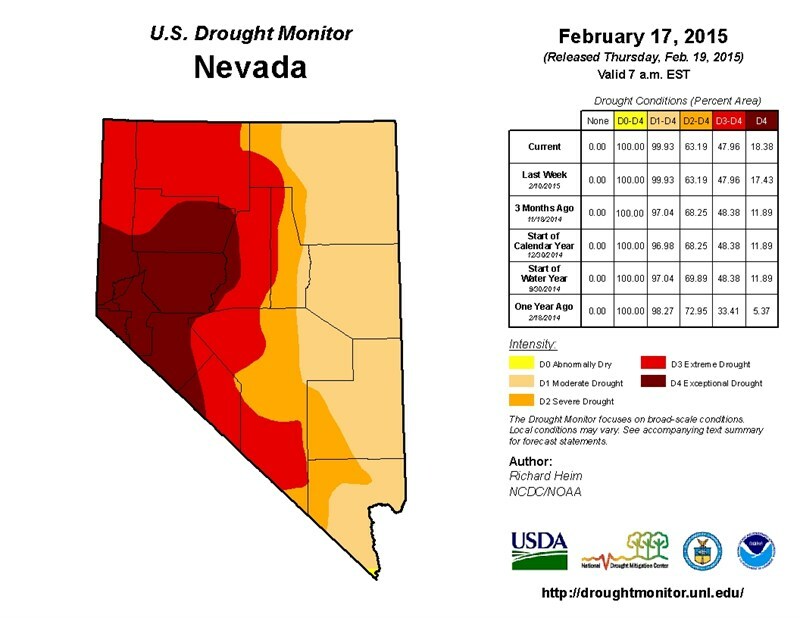 The exceptional drought category was "expanded in Mono and Inyo Counties in California and Esmeralda County in Nevada to reflect dryness in the short term (last 7 days to 6 months) and long term (last 48-72 months)," the report stated. The storm systems in December and early February helped replenish some reservoirs. "But the precipitation fell mostly as rain instead of snow, so the mountain snowpack in the coastal ranges remained dismally below normal, severely impacting the ski industry," according to the report. The Badger Pass Ski Area in Yosemite National Park closed in January due to lack of snow. 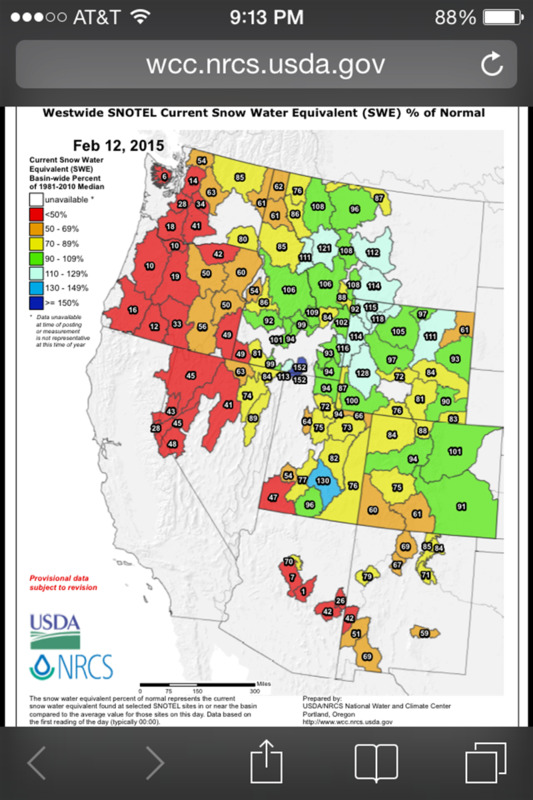 The National Resource Conservation Service (NRCS) reported recently that snowpack is below normal throughout the West, including the Sierra Nevada and the Cascades in Washington and Oregon. 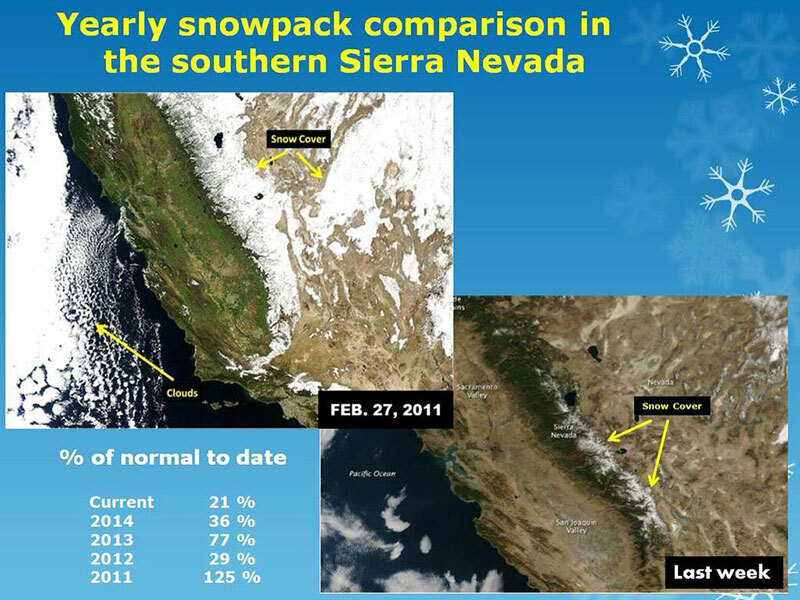 And, persistent above-normal temperatures have caused the dwindling snowpack in the Sierra to melt. South Lake Tahoe, at 6,225 feet, has set new high temperature records several days a week in January and February. The National Weather Service in Reno reported that South Lake Tahoe and Reno set record temperatures for the date Wednesday, February 18, as temperatures were 18 degrees above normal. "According to the NRCS SNOTEL network, mid-February snowpack snow water content ranked in the lowest 5 percent of the historical record at many stations throughout Washington, Oregon, California and Utah, and, in fact, most western states," according to the U.S. Drought Monitor report. The report mentioned that the Almond Board of California reported a "decrease in almond shipments of about 28 percent in January 2015 compared to January 2014." The only positive news in the report for the dry Western U.S. is the forecast that "above normal precipitation" is expected toward the end of February into early March. Also Thursday, the National Oceanic and Atmospheric Administration reported that last month was the second-warmest January on record globally, behind 2007, with temperatures 1.4 degrees above the average for the 20th century. And NOAA said in the U.S. January was 2.9 degrees warmer than normal, making it the 24th warmest January since 1880. As the drought has stretched into a fourth straight year in California, CAL FIRE is getting an early start on staffing for wildfires. (AP) - California officials who are in charge of restricting water as the drought drags on are considering new limits on restaurants, hotels and decorative fountains in addition to existing rules for homeowners. 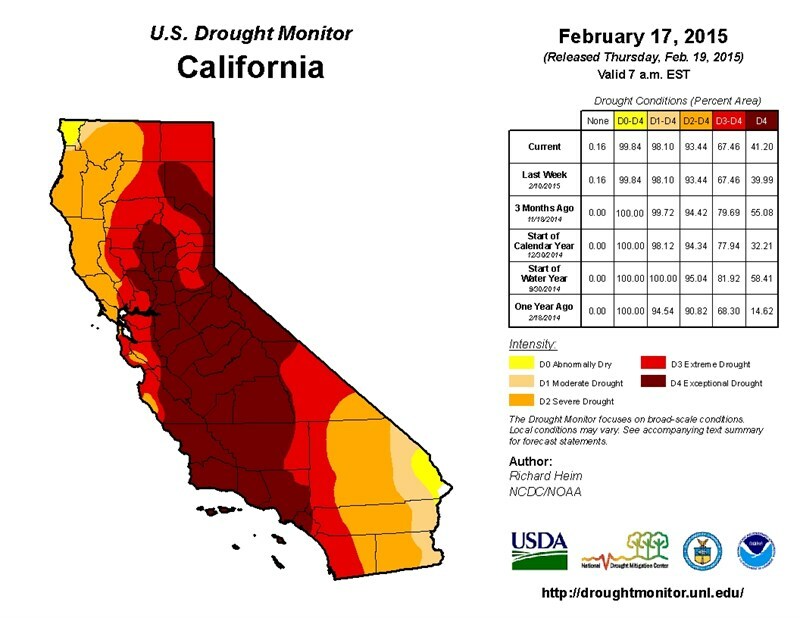 The latest U.S. Drought Monitor points to California's dwindling snowpack in its latest report. After three years of drought, weather forecasters hope the recent storm in Northern California is the beginning of the typical wet pattern. For the first time in 20 years, water managers in the Reno area say they'll use water reserves to meet demand.